We are pleased to announce the 4th annual Triangle Zebrafish Symposium on May 14th, 2018. The event will be held on Duke University’s medical campus in the Trent Semans Center from 9a.m. to 5p.m. The event is free and open to all who register here. Registrations allows you access to the full day of talks, posters, and zebrafish-related camaraderie. Please send this along to your colleagues and coworkers, as we may have missed some individuals from your institution. Parking is available on campus, carpooling and public transit is encouraged. We are excited to host Dr. Kirsten Sadler Edepli, Associate Professor of Biology at NYU Abu Dhabi as our Keynote Speaker. Dr. Sadler Edepli’s lab focuses on the molecular basis of liver development and two important liver diseases, liver cancer and fatty liver disease, using zebrafish as a model system. We would love to hear what you and your lab works on, so please also sign up to give a talk or a poster at the symposium. There will be prizes for best talk and poster (grad student and post doc categories). Please submit your abstract here. Registration is free and closes March 30. You will be notified of your talk or poster slot by April 23. 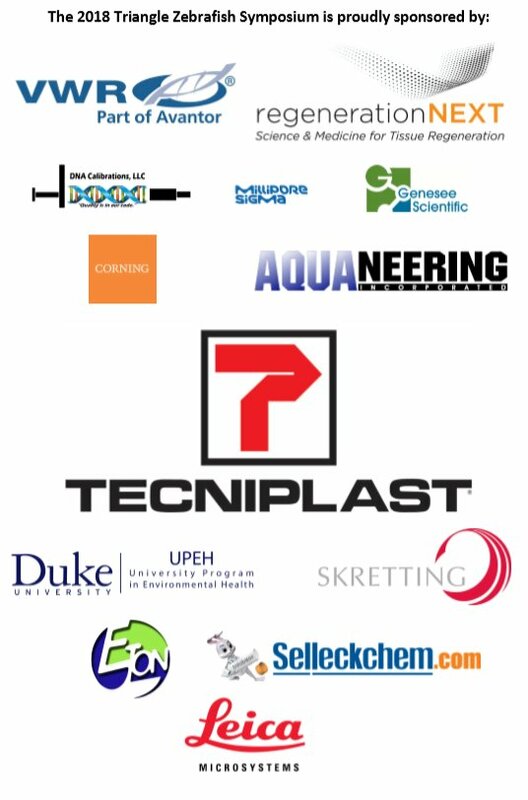 We’re looking forward to seeing you at the Triangle Zebrafish Symposium on May 14th. Please contact me if you have any questions or concerns. * Drink responsibly. Do not drink and drive: make sure you have a safe ride home. Sol on Save the date for the Second Annual Triangle Zebrafish Symposium! Duke Zebrafish Community is powered by WordPress at Duke WordPress Sites. Please read the Duke Wordpress Policies. Contact the Duke WordPress team.